Read Rachel's story. The following is an extract adapted from Finding More: Real Life Stories Worth Telling. Kateryna's story is one of eleven testimonies featured in our new book, Finding More, released earlier this month. Most of us wonder: is there something more to life? 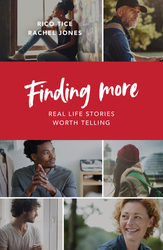 Our latest resource, which will be published on 1 February 2019, Finding More tells the stories of eleven people who asked that question, and found the answer.